Knoxville has a huge racing community. Most local 5ks usually have upwards of at least 500 people per race. It is so great to know that so many people are dedicated enough to wake up on a Saturday and pay to run some miles to better themselves. But sometimes, a smaller race can be good, too. My goal for the year is to run one race per month. I had already had a May race picked out but a few days ago I found out that the race fell on a Saturday that I would be at the beach. The search was on for a great 5k to fill my Saturday. The greater Knoxville area had at least four races going on this past Saturday so it was tough to narrow it down. I stalked last year’s results for the Be a Factor 5k and decided that since it was a very small race, I might as well run it and try to maybe get an age group placement. Race morning came early and I woke up feeling energized, but very untrained. I have never fully trained for any race, but I’ve spent the last two weeks working my way back into running and still get excited if I am able to run more than three minutes without a walk break. A 5k was a big feat for Saturday. Nonetheless, I still managed to get ready and be out the door on time. It started to rain on the way to the race and I began to get nervous. Rain running just ain’t my thing. We arrived at the race site and from the amount of cars, you would have thought it was cancelled. Nope, just a super small race and only ended up having 103 runners. The race benefited a local little boy who had hemophilia and the race was very community oriented. It started on a track at the high school and went out and around town. After leaving the track, we headed onto a road and up a hill. The hill wasn’t steep, but it was definitely long. I was able to run the first .75 miles without stopping which made me so proud. I was trying to look around and get a feel for who all was close to my age and tried to gauge if I would have to “pick off” anyone to have a chance at placing in my age group. After the first mile, I took another walk break and just tried to not freeze to death. From there, it was off and on running and walking, but I managed to run harder than I thought I would be able to. There were several slight grades out on the course, but not really any serious hills. There were two huge downhills that I just let loose on and tried to make up for lost time by flying down them. Probably a dumb move, but I was able to pass a few people and didn’t feel any tightness in my legs. Around the 2.5 mile mark, I came upon a young kid who was walking and I decided to take one more walk break. He said “man, we are making AWESOME time, aren’t we??”. Bless his heart. I told him yes we were and he went into a funny story about how he took a Zumba class the previous night. Such a sweet kid. I decided to leave him and continue running and after that point, I did not stop. I knew we had to make a final lap around the track to finish so I was looking forward to being able to get a glimpse of the finish line. I’ve never done a race where we got to run around a track so it was pretty cool and made me feel like an Olympian. I didn’t go all out at the finish line or even sprint but I definitely finished strong. Another great thing about small races is the crowd support. The announcer made it a point to yell out every person’s name and number and encourage the crowd to cheer. 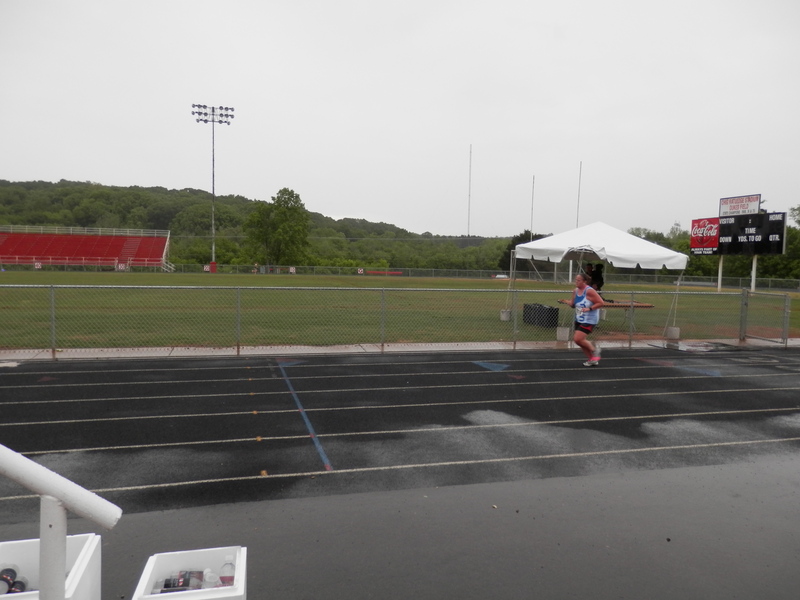 The finish line was really exhilarating. I didn’t really have a goal for the race, but it was important to me to finish faster than any of my other three 5ks I’ve ran this year. In order to do that, I would have had to run a 35:49. Not even remotely close to a PR, but still faster than I was earlier this year. I ended up clocking in at 34:10. It was a great feeling to knock over 1:30 off my previous time and I’m confident that next month’s race will be even faster. Walking down that time to get to where I used to be. The post-race refreshments included some amazing homemade cupcakes. Of course I had to have one, but it was a little sweet so I only ended up eating about a fourth of it. We took shelter under the football stadium and waited for the results to be called. When my division was announced I held my breath. I knew my time wasn’t amazing or anything but it was a small race so I still hoped to walk away with something. The third place got called and it wasn’t me so I figured I had blew my chance. But just when I had lost hope, they called my name for first place. I let a slight squeal and ran up to get my flashy medal. It is pretty sad that I ran a 34:10 and still placed first but I am so so soooo excited that I placed top of my age group. First time that has ever happened with there actually being someone else in my age category. Pretty exciting day for me. 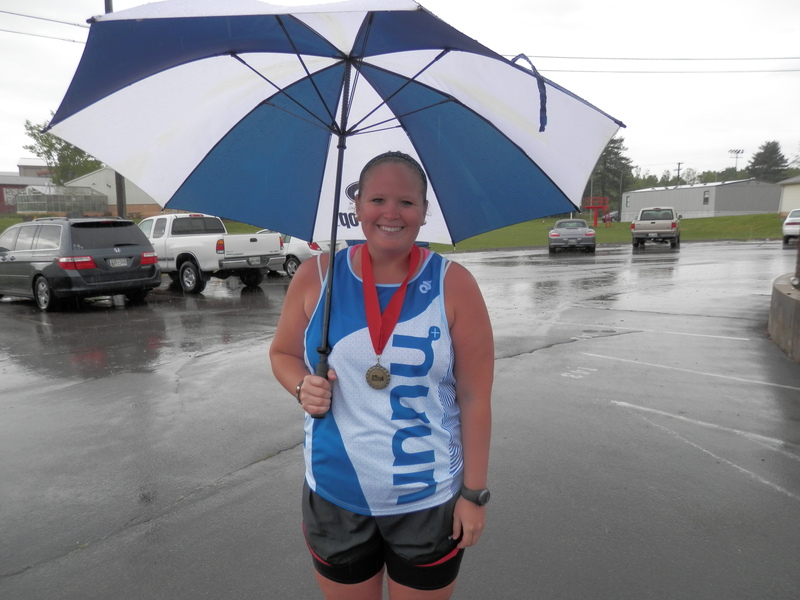 umbrella and a medal make for a happy runner. Overall I’m glad I picked this race and proud that I stuck it out in the rain and was able to knock 1:30 off my last time. It makes me excited to run some more this week and work harder on getting fast(er). Happy day after Cinco de Mayo!! 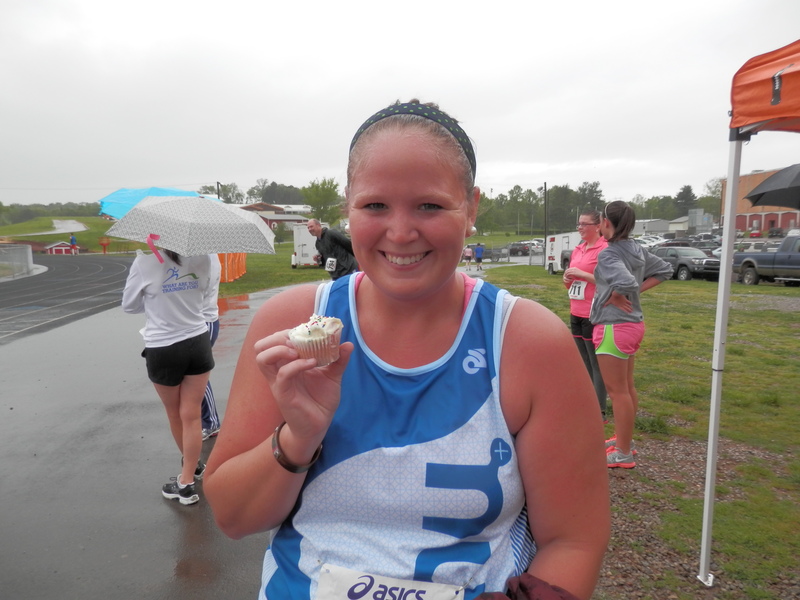 This entry was posted in Race Recaps and tagged be a factor 5k, fat girl runs, race recap by thegogirlblog. Bookmark the permalink. AWESOME JOB! Congrats on the run! Yay!!! Congrats on your first place finish! That’s so awesome! You need to team back up with you kid! Good job! Especially for the cause. Love you little girl! Great job! I love your race recaps! Hi there–>that is a great time and something to be proud of. Looking forward to more posts! My husband always says that the only people you have to beat are the ones that show up on race day! Well deserved, my friend!!! Aw! That’s so great! Congrats! Can’t wait to see what you do next month. YOu are killin’ it! congrats!! so proud of you! !